, a noted mathematician, was born at Brescia in Italy, probably towards the conclusion of the fifteenth century, as we find he was a considerable master or preceptor in mathematics in 1521, when the first of his collection of questions and answers was written, which heafterwards published in 1546, under the title of “Quesiti et Invention! diverse,” at Venice, where he then resided as a public lecturer on mathematics, he having removed to this place about 1534. This work consists of nine chapters, containing answers to a number of questions on all the different branches of mathematics and philosophy then in vogue. 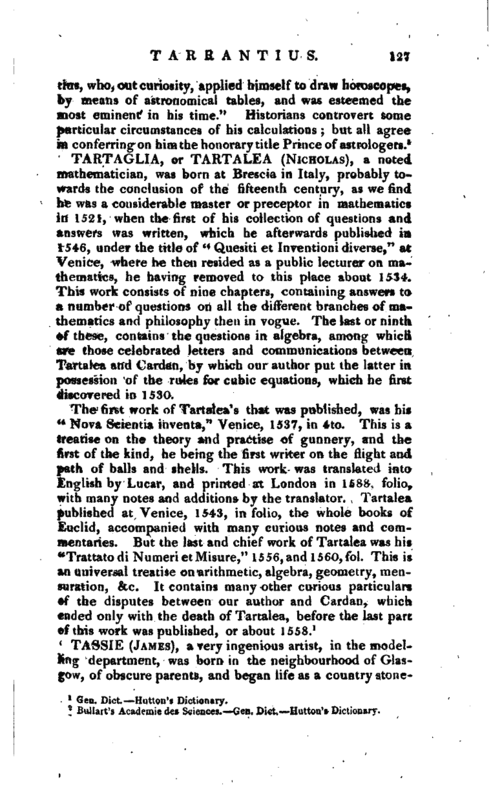 The last or ninth of these, contains the questions in algebra, among which are those celebrated letters and communications between Tartalea and Cardan, by which our author put the latter in possession of the rules for cubic equations, which he first discovered in 1530. "Bullart’s Academie des Sciences.—Gen. Dict.—Hutton’s Dictionary.